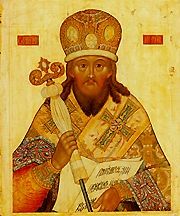 Our Father Among the Saints Dimitri of Rostov (also Dmitri, Dimitry or Demetrius) was a great 17th century hierarch, preacher, author and ascetic. He was born near Kiev in the year 1651, and reposed in the year 1709. Among his many glorious works of instruction, he was known especially for his translation and publication of The Lives of the Saints. He foresaw his own death three days in advance, and died while at prayer. Dimitri was a great light of the Russian Church and of Orthodoxy in general. He had heavenly visions during his life. He served the Lord zealously and took up his habitation in the Kingdom of Heaven. St. Dimitri also composed a service to the Nine Martyrs of Cyzicus, in which he wrote "through the intercession of these saints, abundant grace was given to dispel fevers and trembling sicknesses." St. Dimitri also described the sufferings of the holy martyrs and wrote a sermon for their feast day. St. Dimitri's life is celebrated on October 28, but on September 21 the Church commemorates the finding of his miracle-working relics in 1752. Open, O doors and bolts of my heart, that Christ the King of Glory may enter! Enter, O my Light, and enlighten my darkness; enter, O my Life, and resurrect my deadness; enter, O my Physician, and heal my wounds; enter, O Divine Fire, and burn up the thorns of my sins; ignite my inward parts and my heart with the flame of thy love; enter, O my King, and destroy in me the kingdom of sin; sit on the throne of my heart and alone reign in me, O thou, my King and Lord. He who loves his enemy subdues the waves of the sea and stills the storm. Therefore love your enemy, and you will be a new wonderworker, saving his soul and your own... Begin from henceforth to love everyone. The Son of God will be your guarantor. Without a doubt you will become a son of the Most High. I desire this sonship for myself and for everyone. Amen. This page was last edited on October 23, 2012, at 18:19.